Today, however, Saudi oil policy has reversed course, with MbS now trying to push prices towards the $80/bbl level assumed in this year’s Budget. 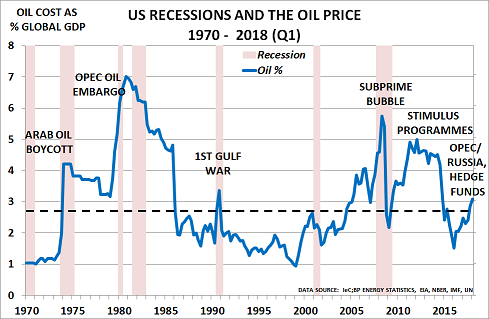 The result, as the chart above confirms, is that prices are now at levels which have almost always led to recession in the past. It compares the total cost of oil* as a percentage of global GDP with IMF data for the economy, with the shaded areas showing US recessions. The tipping point is when the total cost reaches 3% of global GDP. And this is where we are today. The reason is that high oil prices reduce discretionary spending. Consumers have to drive to work and keep their homes warm (and cool in the summer). So if oil prices are high, they have to cut back in other areas, slowing the economy. There has only been one occasion in the past 50 years when this level failed to trigger a recession. That was in 2011-14, when all the major central bank stimulus programmes were in full flow, as the left-hand chart shows. Now Saudi is trying again. It agreed with OPEC and Russia in December to cut production by 1.2mbd – with reductions to be shared between OPEC (0.8 million bpd) and its Russia-led allies (0.4 million bpd). But as always, its “allies” have let it down. So Saudi has been forced to make up the difference. 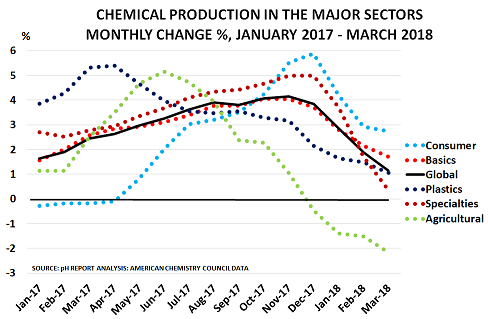 Its production has fallen from over 11mbd to a forecast 9.8mbd in March. 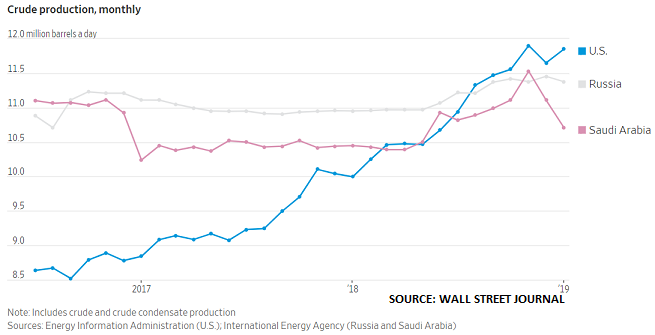 Russia’s output is also above Saudi’s at 11.2mbd as it has cut output by just 78kbd versus its promised target. Of course, geo-politics around Iran or Venezuela or N Korea could always intervene to support prices. But for the moment, the main support for rising prices is coming from the hedge funds. 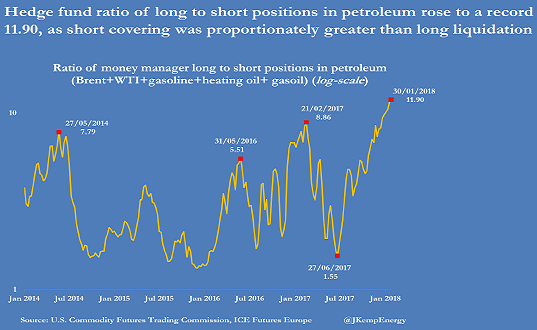 As Reuters reports, their ratio of long to short positions in Brent has more than doubled since mid-December in line with rising stock markets. But the hedge funds did very badly in Q4 last year when prices collapsed. And so it seems unlikely they will be too bold with their buying, whilst the pain of lost bonuses is so recent. Companies and investors therefore need to be very cautious. Saudi’s current success in boosting oil prices is very fragile, as markets are relying on more central bank stimulus to offset the recession risk. If market sentiment turns negative, today’s roller-coaster could become a very bumpy ride. Given that Saudi has decided to ignore al-Naimi’s warning, the 2014-15 experience shows there is a real possibility of oil prices returning to $30/bbl later this year. Today, we have “lies, fake news and statistics” rather than the old phrase “lies, damned lies and statistics”. But the general principle is still the same. Cynical players simply focus on the numbers that promote their argument, and ignore or challenge everything else. Iran is in the news following President Trump’s decision to abandon the nuclear agreement, which began in July 2015. OPEC data shows its output has since risen from 2.9mbd in Q2 2015 to 3.8mbd in April – ‘shock, horror’! 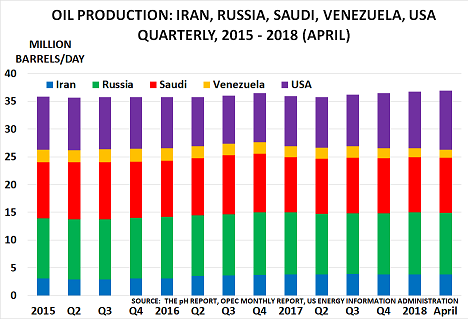 Russia has also been much in the news since joining the OPEC output agreement in November 2016. But in reality, it has done little. Its production was 11mbd in Q3 2016 and was 11.1mbd in April- ‘shock, horror’! Saudi Arabia leads OPEC: its production has fallen from 10.6mbd in Q3 2016 to 9.9mbd in April- ‘shock, horror’! Venezuela is an OPEC member, but its production decline began long before the OPEC deal. The country’s economic collapse has seen oil output fall from 2.4mbd in Q4 2015 to just 1.5mbd in April- ‘shock, horror’! The USA, along with Iran, has been the big winner over the past 2 years. Its output initially fell from 9.5mbd in Q1 2015 to 8.7mbd in Q3 2016, but has since soared by nearly 2mbd to 10.6mbd in April- ‘shock, horror’! But overall, output in these 5 key countries rose from 35.5mbd in Q1 2015 to 36.9mbd in April. Not much “shock, horror” there over a 3 year period. More a New Normal story of “Winners and Losers”. “The majority of our inputs, the vast majority, are price-driven. And the overwhelming factor we capitalise on is the tendency of crowd behaviour to drive medium-term trends in the market.” (my emphasis). Even worse news may be around the corner. Last week saw President Trump decide to withdraw from the Iran deal. His daughter also opened the new US embassy to Jerusalem. Those with long memories are already wondering whether we could now see a return to the geopolitical crisis in summer 2008. As I noted in July 2008, the skies over Greece were then “filled with planes” as Israel practised for an attack on Iran’s nuclear facilities. Had the attack gone ahead, Iran would almost certainly have closed the Strait of Hormuz. It is just 21 miles wide (34km) at its narrowest point, and carries 35% of all seaborne oil exports, 17mb/d. As Mark Twain wisely noted, “history doesn’t repeat itself, but it often rhymes”. Prudent companies and investors need now to look beyond the “market-moving, shock, horror” headlines in today’s oil markets. We must all learn to form our own judgments about the real risks that might lie ahead. Given the geopolitical factors raised by President Trump’s decision on Iran, I am pausing the current oil forecast. 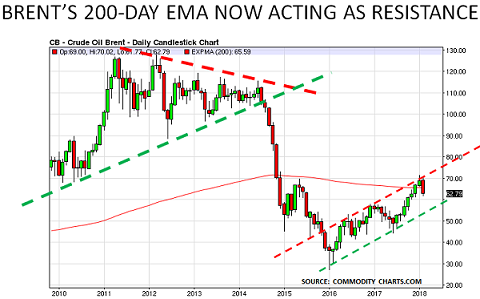 The post Oil prices flag recession risk as Iranian geopolitical tensions rise appeared first on Chemicals & The Economy. “For the last 6 months, everyone who buys oil or other commodity-related products has been busy building as much inventory as they could afford. In turn, of course, this has made it appear that demand has suddenly begun to recover. At last, it seems, the “synchronised global recovery” has arrived. In other words, value destruction has been taking place since 2000. 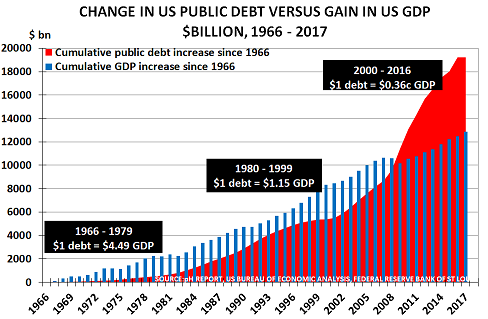 The red shading tells the story very clearly, showing how public debt has risen out of control as the Fed’s stimulus programmes have multiplied – first with sub-prime until 2008, and since then with money-printing. Last week saw the yield on the benchmark US 10-year Treasury Bond reach 3%, double its low in June 2016. It has risen sharply since breaking out of its 30-year downtrend in January, and is heading towards my forecast level of 4%. Higher interest rates will further slow demand, particularly in key sectors such as housing and autos. 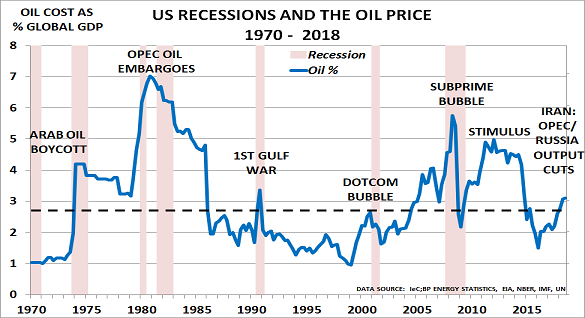 And in combination with high oil and commodity prices, it will be no surprise if the global economy moves into recession. 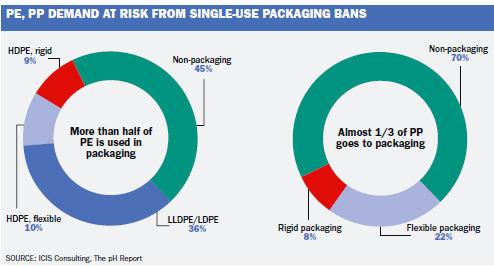 Chemicals is providing the vital early warning of the risks ahead. But as usual, it seems policymakers prefer to wear their rose-coloured spectacles. And then, of course, as with subprime, they will all loudly declare “Nobody could have seen this coming”. 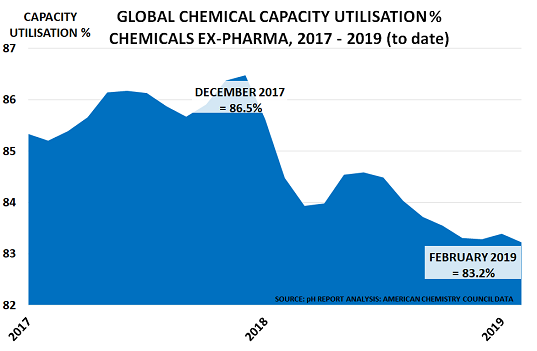 The post Chemicals flag rising risk of synchronised global slowdown appeared first on Chemicals & The Economy. The size of the rally has also been extraordinary, as I noted 2 weeks ago. At its peak, the funds owned 1.5bn barrels of oil and products – equivalent to an astonishing 16 days of global oil demand. They had bought 1.2bn barrels since June, creating the illusion of very strong demand. 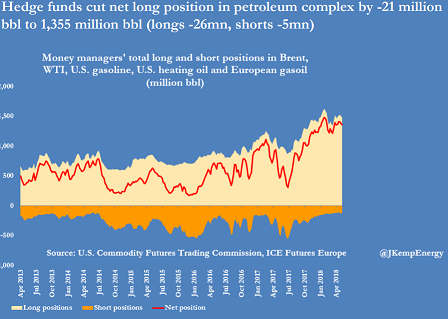 But, of course, hedge funds don’t actually use oil, they only trade it. The funds also don’t normally hang around when the selling starts. And so last week, as the second chart shows, they began to sell their positions and take profits. The rally peaked at $71/bbl at the end of January, and then topped out on 2 February at $70/bbl. By last Friday, only a week later, Brent was at $63/bbl, having fallen 11% in just one week. Over the summer, therefore, many industrial companies will likely need to start issuing profit warnings, as it becomes clear that demand has failed meet expectations. This will put stock markets under major pressure, especially if interest rates keep rising as I discussed last month. Smart CEOs will now start to prepare contingency plans, in case this should happen. We can all hope the recent downturn in global financial markets is just a blip. But hope is not a strategy. And the risk of profit warnings turning into major bankruptcies is extremely high, given that global debt now totals $233tn, more than 3x global GDP. 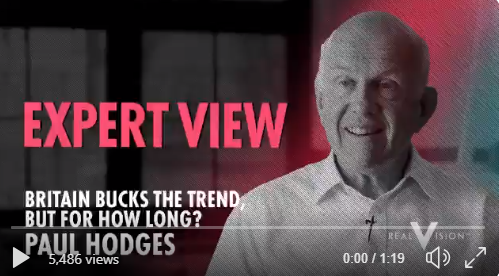 I strongly believe that forecasts should be monitored, which is why I always review the previous Annual Budget forecast before issuing the next Outlook, and always publish the complete list of Annual Budget Outlooks. Since January, I have also been monitoring my blog forecasts, using the percentage mechanism highlighted in Philip Tetlock’s masterly “Superforecasting” book. Today’s forecast for oil prices to fall initially to $50/bbl is therefore now added to those on ethylene/polyethylene and the US 10-year interest rate. I am also increasing the confidence level for the interest rate forecast to 70%, and will continue to update these levels when circumstances change. 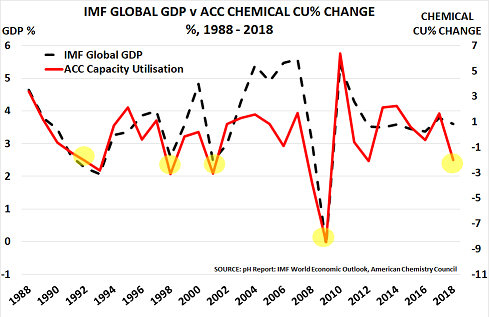 The post Economy faces slowdown as oil/commodity prices slide appeared first on Chemicals & The Economy.